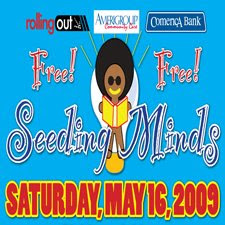 HOUSTON– rolling out, along with AMERIGROUP Community Care and Comerica Bank, is excited to present another Seeding Minds spectacular on Saturday, May 16, 2009, at Gregory Lincoln Education Center located at 1101 Taft St., from 10:00 a.m.–2:00 p.m. This is a FREE event! Seeding Minds is a youth literacy initiative that targets K–8th grade students. The event is open to everyone and parents are encouraged to attend with their children. The purpose of Seeding Minds is to improve the literacy and reading comprehension of all youth. Make plans to attend Seeding Minds. There will be celebrity guest appearances, including teen sensation Baby Jay, the first rapper and the youngest to receive a key to the city of Houston. We will celebrate the official Baby Jay Day at Seeding Minds. Children’s authors Keith Davis Jr., Diane King and Carolyn Forsche will read from their latest works. Motivational speakers Dr. Wendy Johnson and Jesse Muhammad will speak about self-esteem and the importance of education. Each child will leave with a greater love for learning, plus many great prizes from our sponsors. Also, every child will receive a book to start or add to their personal library.